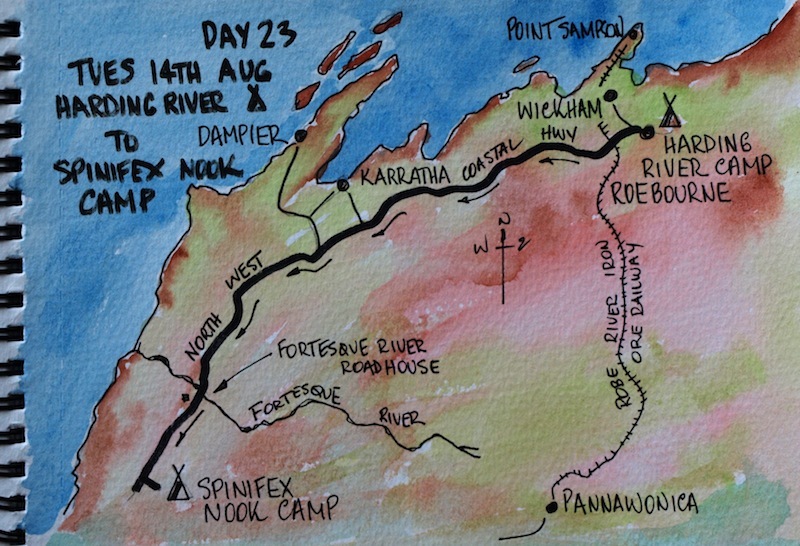 HARDING RIVER CAMP to SPINIFEX NOOK CAMP. 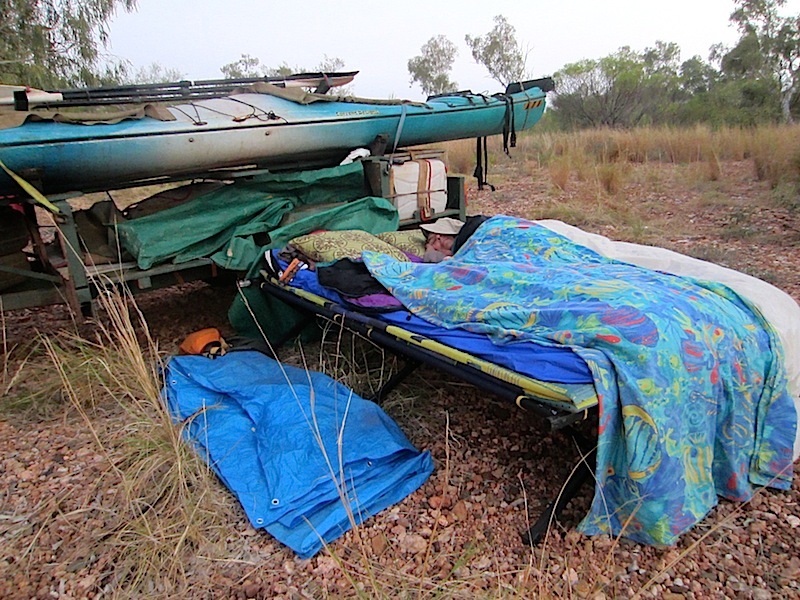 (South of Dampier) Last night we slept on stretchers under the stars. It was a great night, far better than in the Roebourne Caravan Park. First thing this morning a mob of brumbies with foals came to camp, we wouldn’t have had that in the caravan park. We also sat around the fire for a bit waiting for the washing to dry, wouldn’t have been able to do that in the caravan park. We both agreed it was the best decision to pull out of the caravan park and camp on the Harding once more. Time for writing while the washing dries. This morning we visited the local art galley once more. The women there were a jolly lot and from the reception I reckon it wouldn’t take long to get to know them. 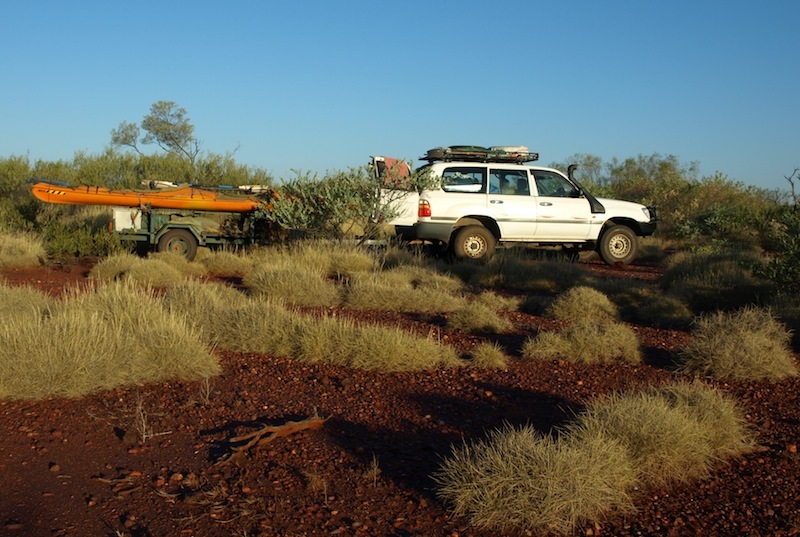 The last chore to do in Roebourne was to top up our car with diesel, 58 litres cost $100 ($1-72 per litre). Bev asked if we could top up our water drum but the reply was that they don’t do water, you have to get it from the tourist information centre (for a donation). This was the first time we have ever been refused water! Mid morning we drove out to Dampier and after seeing the iron ore loading facility (loading six ships at one time) I have come to the conclusion that anywhere mountains run down to the sea (usually the most picturesque spots) the sea is the deepest so this is the best place to build a loading facility. Loading ore means a polluted atmosphere and buildings covered with fine dust, I think you are visualising the picture I am painting. Those working in the region probably don’t see the grime, they only see dollars. There is a lot of money in these parts, obvious by the number of big boat trailers parked next to the boat ramp. 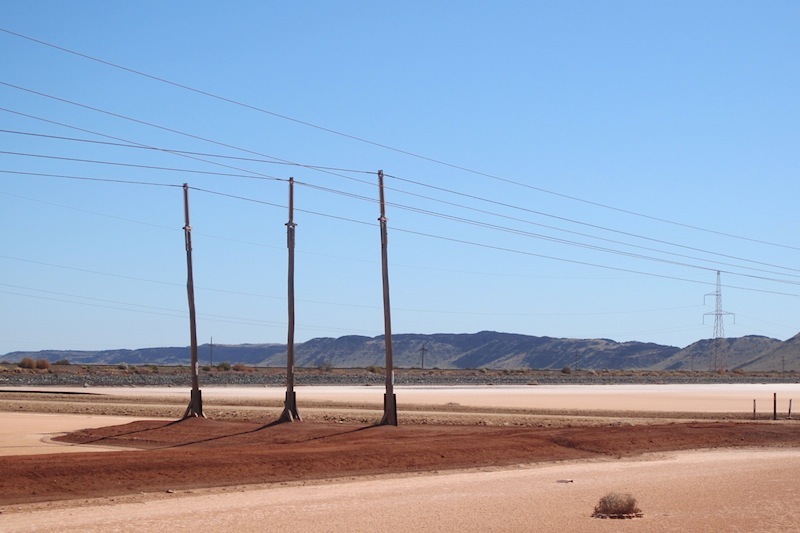 The town of Karratha is a modern frontier town, new housing estates have spread across the spinifex plains, electrical transmission lines go every which way and four lane carriage ways with traffic lights and round-a-bouts are circling the town. 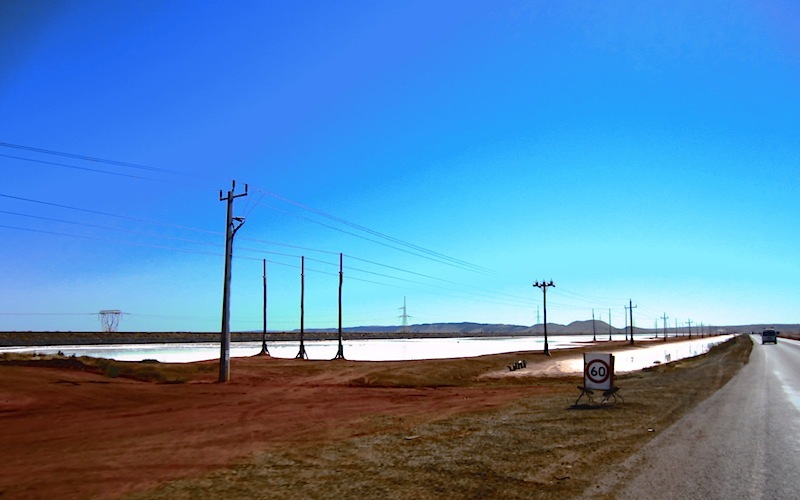 The salt flats between Karratha and Dampier. 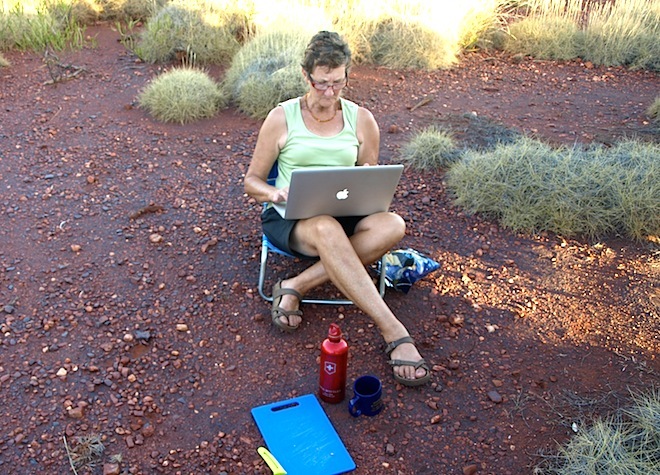 Tonight we are having a free camp on a spinifex plain to the south of Karratha. We are tucked into a nook and it is going to be a fine camp. A delicate flower, unknown species. 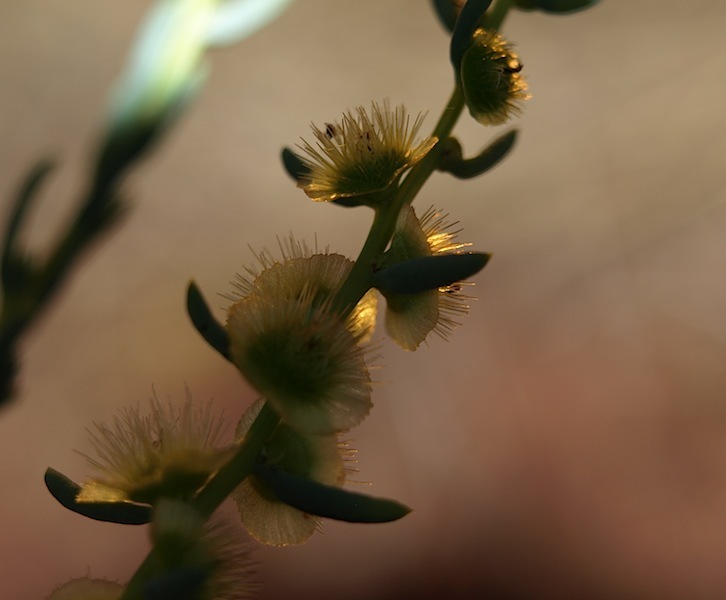 I was sitting on a low chair and noticed this delicate plant under the car, the sun was on it for just seconds and I crawled under the car to get the shot. The flower was only about 5 mm in diameter. A very acceptable camp last night, the diamonds in the sky came down to the horizon. Stretcher beds were the order of the night, which was OK until early morning. Moisture from a heavy dew ponded in the low spots of our sleeping bags and soaked through onto us so around 5.30 we were sitting by the fire, drying our sleeping bags and having a cuppa. Bev was a bit concerned that our sleeping bags were wet but I said ‘no worries, we’ll soon have them dry. I inherited my easy-going attitude to life from my father who I remember saying to my mother, ‘Don’t worry about it, Mumma’ after the centre pole of our tent fell down in the middle of the night during a boisterous storm. The pole ripped the side of the tent open allowing the rain to pour onto our bedding. 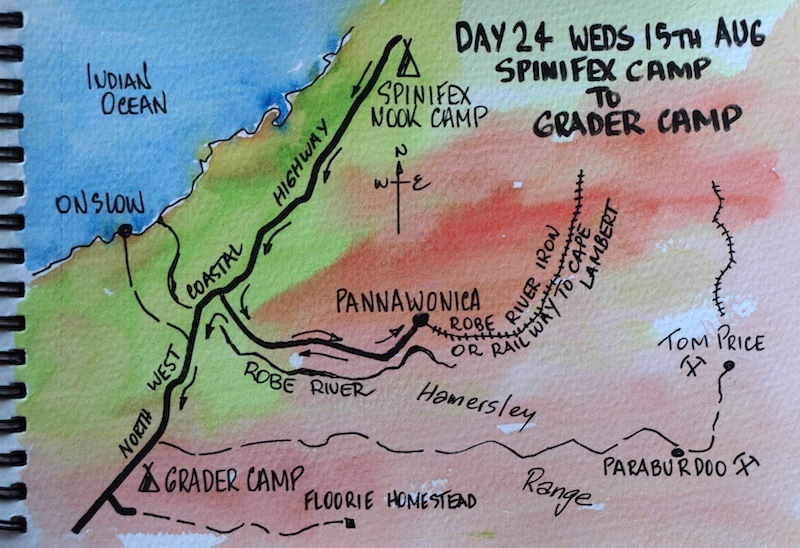 I called the camp the ‘spinifex nook’ camp because we are surrounded by spinifex. There are all sorts of nooks but the one I like is an inglenook which is a seat inside an open fireplace such as you would find in English manor houses. There is no doubt we are in iron ore country. I dropped a torch, which has a built-in magnet, and it came up with iron filings attached. Our main activity for the day today was to visit the iron ore town of Pannawonica, to see how it has developed since 1970. 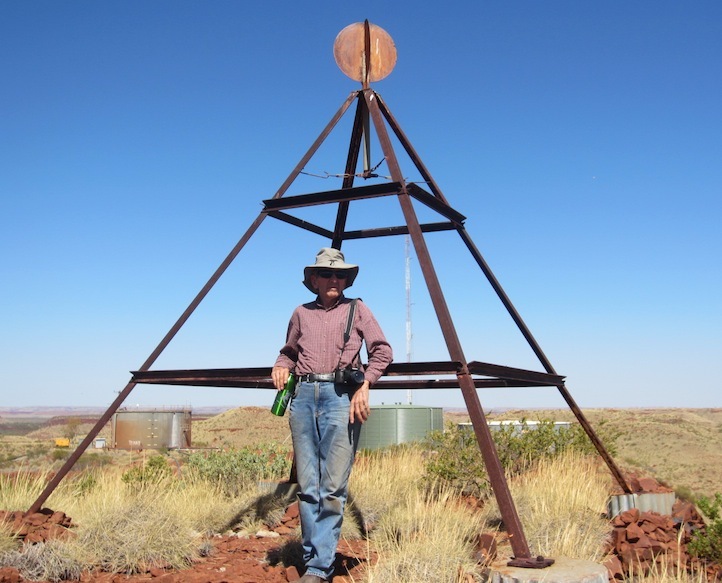 Ian, Holly and myself were on the survey team that surveyed the centre line for the Cliffs Robe River iron ore railway from Cape Lambert to Pannawonica and part of the survey was to establish trigonometrical (Trig) stations on a couple of hills overlooking the town. I wanted to go up and have a look at our handy work. One of our trig stations. Directly underneath in the centre of this frame is a benchmark comprising a bronze plaque set in concrete. 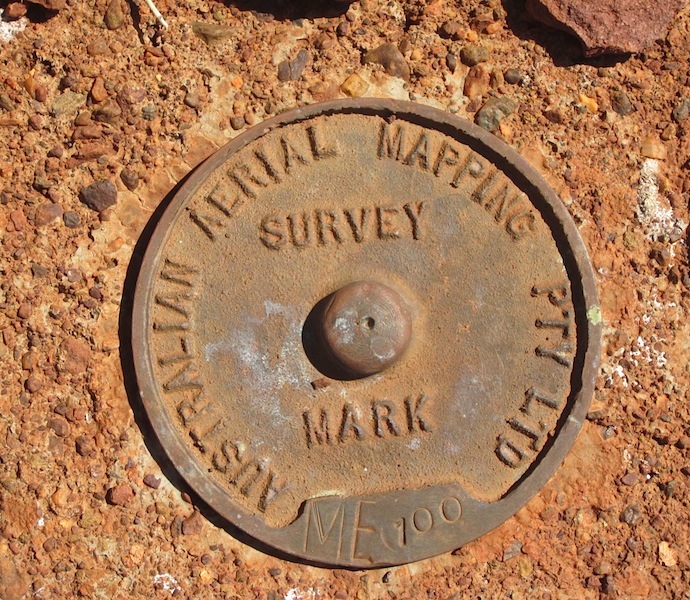 Australian Aerial Mapping was the company we were working for. Because there was no road up as there is today we backed our Landrover up the hill as far as possible so we could get the sand, cement and water to the top of the hill for the trig station foundations. We then connected a rope to the tow ball that ran up, around a star iron and back down to an FJ Holden bonnet. We loaded the bonnet with materials and then drove the Landrover down and out onto the flat; the bonnet shot up to the top with its load. Standing on the concrete foundation. Pannawonica industrial estate is in the foreground and the town of Pannawonica on the horizon. After establishing the trig stations we set out some of Pannawonica town, including placing pegs at the school, police, service station and ambulance station. Bev and I visited the office of Rio Tinto (the owners of Robe River) and had a look at satellite images of the mining activity, which these days is extensive. I remember well the last peg we drove in, glad to be at the end of the 106 mile survey. Today the weather was perfect but during the survey period we worked through the wet season surviving two cyclones. At the end of the survey we were offered shares in the project at a dollar each but declined because we needed the money for more adventures. Today the shares are worth $60 each. That’s how life is, a series of missed opportunities. 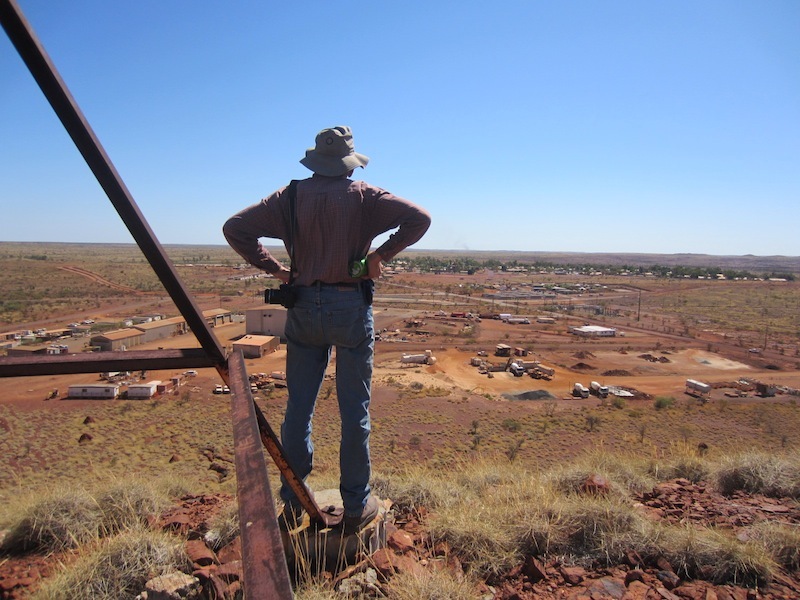 From on high we could see some of the solid iron ore mesas that have been mined. 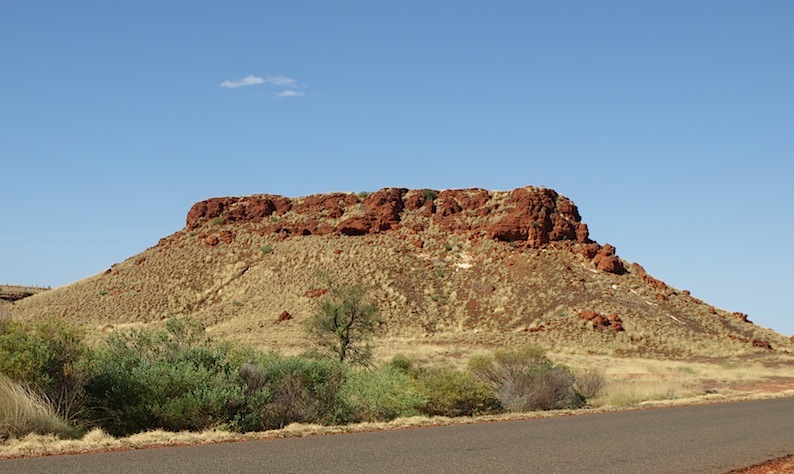 To get at the ore all that had to be done was blast and scrape the tops, the ore that rumbled down to the plains below was then gathered and loaded onto the waiting trains for transportation to Cape Lambert where it was shipped off to overseas markets. 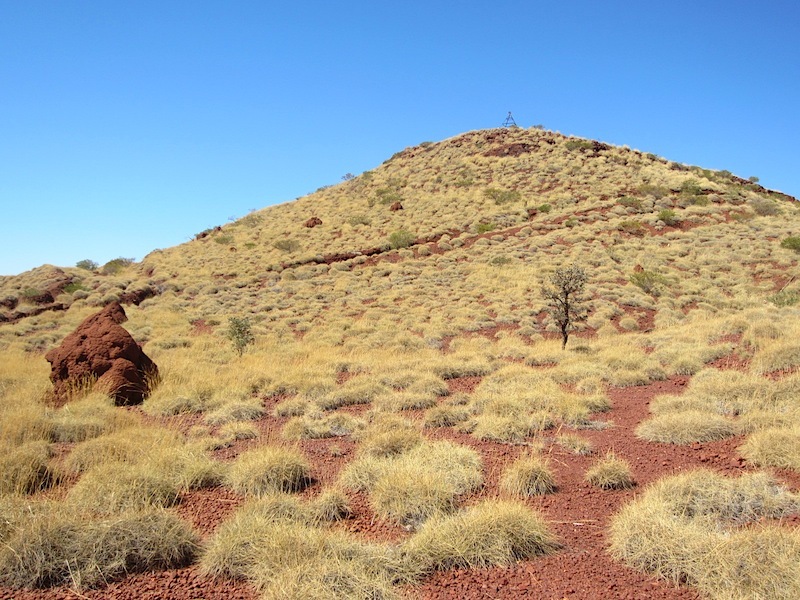 The iron ore is accessed by shaving the tops of the mesas.The dark horizontal bands are where mesas once were. Came out of Pannawonica around lunchtime, satisfied we had seen enough. Bev wanted to see a train but it meant we would have had to hang around for three hours, which we didn’t really want to do. Stopped at a creek on the way out and made lunch. I have to say the sandwich made from fresh Pannawonica sourdough bread, tomatoes with taste and lettuce was probably the best we have had on this leg of our journey. 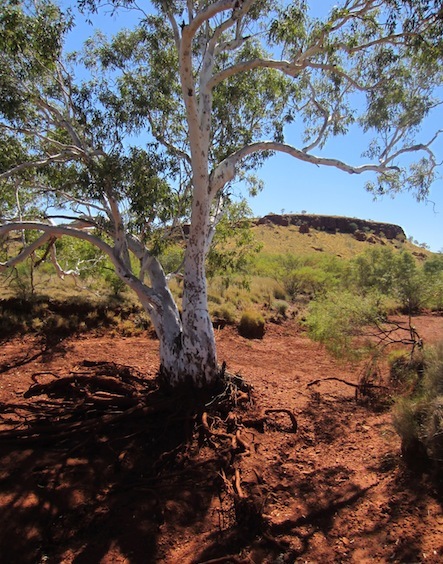 The creek we stopped at had Hans Heysen-style River red gums growing along the bank edge and with the red iron ore mesa backdrop it was very picturesque. Over lunch we planned our next move which meant making phone calls to the Onslow and Exmouth tourist info centres. ‘I want a tent site by the sea, with no caravans and generators nearby. 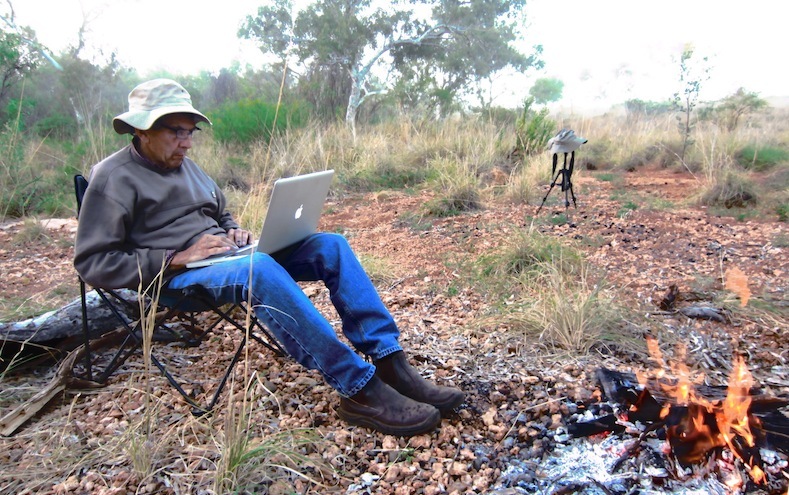 Can you suggest anywhere we can camp?’ Not possible was their reply. I called a couple of private camping areas on the coast and was advised that they can find a spot but we have to have a chemical toilet. I said I wasn’t a caravanner, I simply wanted a tent site and was prepared to take my crap out when I leave. But that wasn’t acceptable. We could hire one for $15-00 a day. This story was repeated a number of times so I rang the national park office and it was the same story except the girl gave me her supervisor’s number to make a complaint. I rang the number and, you guessed it, a recorded message! I can understand why it is necessary to have some sort of control as evidenced at most roadside stops where there is toilet paper everywhere. But I think the majority of people who bush camp are aware enough to bury their waste responsibly. So the outcome of the half dozen phone calls was we are not sure if we are going to actually kayak in the famed waters of the Ningaloo Reef, which is a shame, but that’s how it goes when there are too many people plying the roads these days. Tonight we are camped on the edge of a private property road. Normally we would hide ourselves but tonight I’m hoping that, being exposed, a property owner or worker might stop to check us out. It would mean meeting a West Australian not involved with tourism, a first for this trip. Before retiring to our tent tonight, (no sleeping under the stars tonight as we do not want a repeat of last night’s wet camp) we packed up completely so if we get asked to move on all we have to do is pack up the tent. One car heading to the homestead down the road on which we are camped went past but didn’t stop. 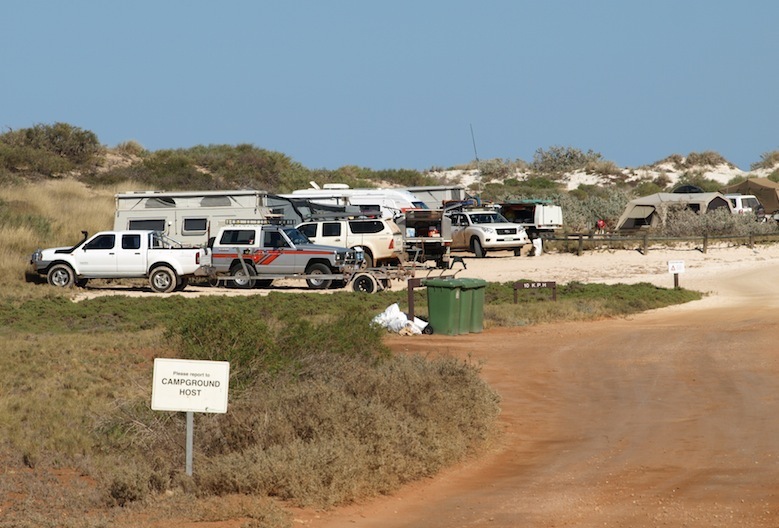 Tomorrow we will head for Exmouth and Ningaloo Reef and if we can’t find a place to stay devoid of caravans, generators and where the toilet arrangements are not complicated we will move on south. This morning at 5-30 I was up and writing mainly because I had been in bed for near seven hours and that’s plenty long enough. Drove through some pretty impressive mesa country early then onto flat scrubby plains where we pulled up and had breakfast. Because we were on the road so early meant we could procrastinate, it was one of those rare moments on the road when the sun begged us to stay. Soon after breakfast we turned onto the Exmouth road which passed through red sandhill and swale country totally devoid of vegetation. A devastating fire swept through the area in December 2011. It will take hundreds of years for the country to revegetate if it doesn’t blow away before then. I think there are other factors at play to make this country as bare as this because I find it hard to imagine there would be sufficient fuel to generate a fire. And where is all the burnt plant material? 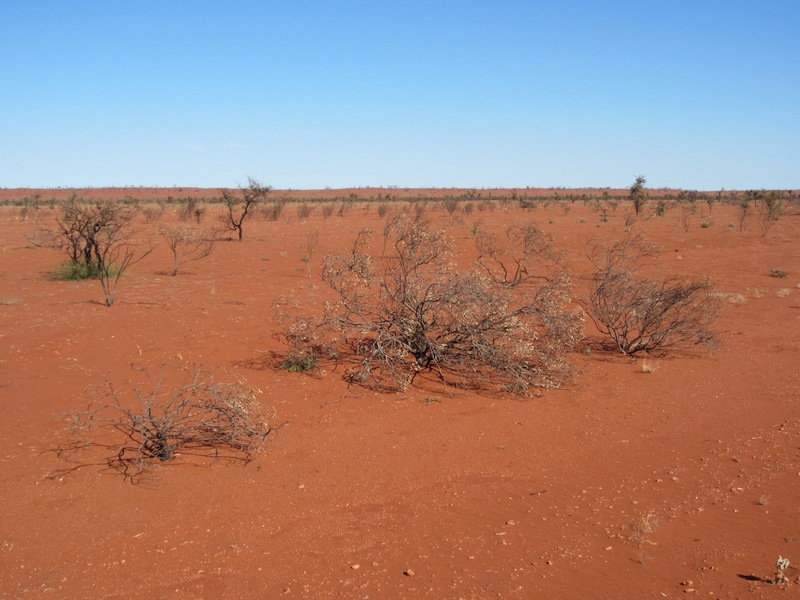 I think drought and overgrazing may also be involved. 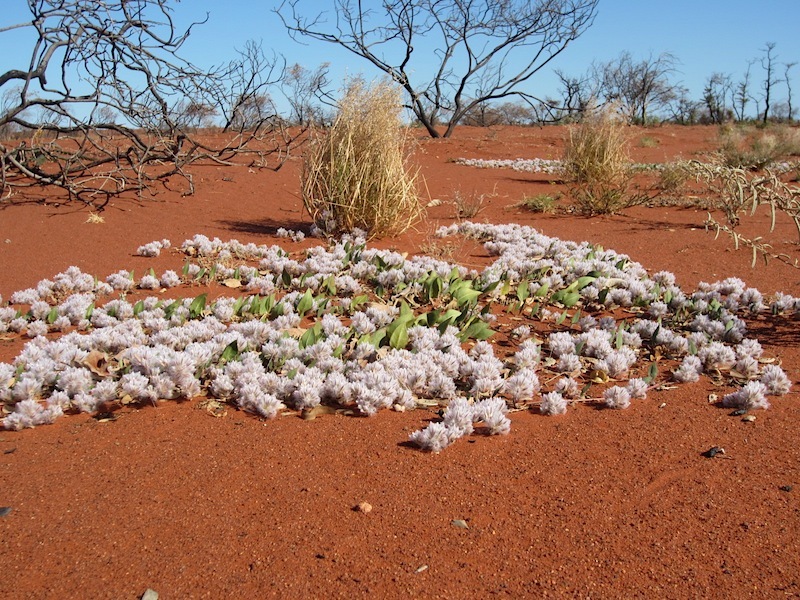 Fox tails are one of the many plants called volunteer plants and they are the first to establish themselves on degraded land. After the burnt sandhill country we turned north onto Burkett Road that leads to Exmouth. Exmouth is a miniature Broome, geared up for the tourists. To rent a one bedroom apartment will set you back $980 per week. That will give you an idea as to the real estate activity here. A bloke from down south (Perth way) who we struck up a conversation with just bought a 10 acre bare block of land on the edge of town which cost him ‘600’ (thousand). It is daunting for us deciding where to stay when in a town like Exmouth, especially after being told that the national park camping areas were full and so were the caravan parks in town. There was only one option and that was to get on the iPad and google to see if maybe there might be somewhere to pitch a tent. 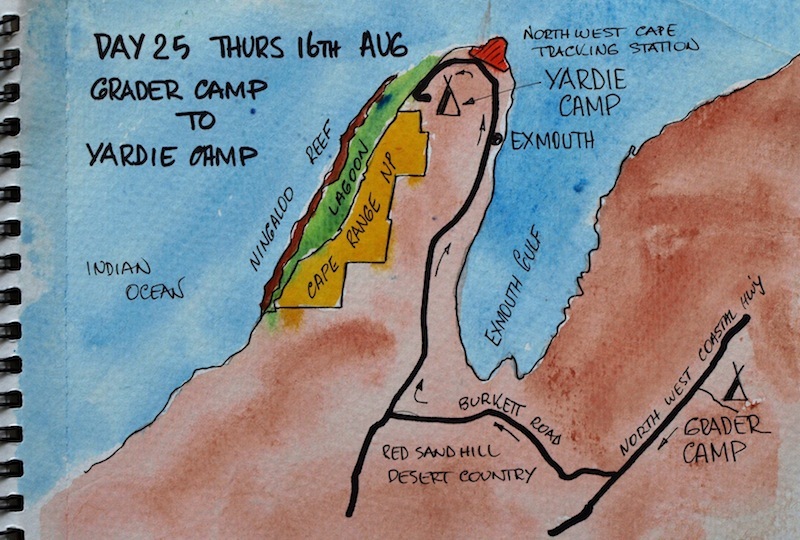 It didn’t take long before it found us a place called Yardie Homestead and it is right on the northern edge of the Cape Range national park from where Ningaloo Reef can be accessed. 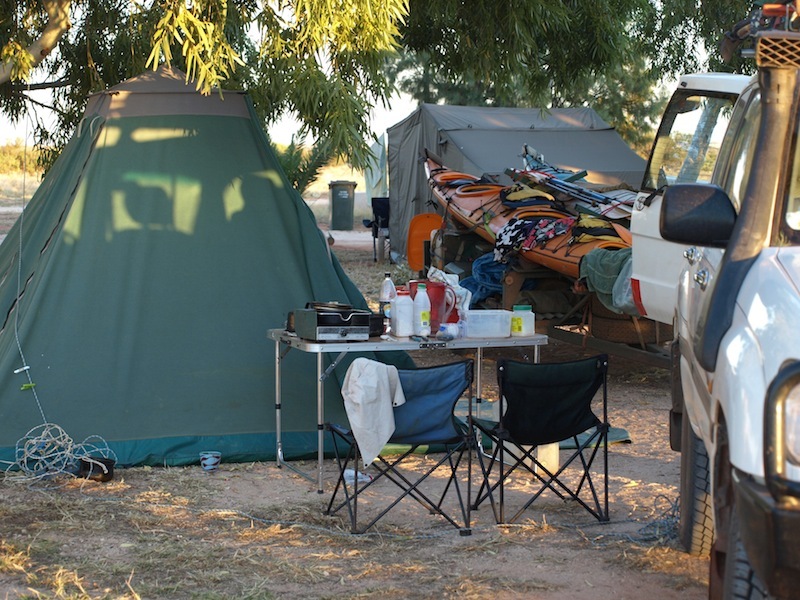 The only downside was that it was one of ‘those’ caravan parks, wall-to-wall vans, but at least there was a large isolated area for tents and no generators. So the negatives were outweighed by the positives. This afternoon a reconnoitre for the best launch site for a paddle tomorrow found a spot but we will have to launch on a rising tide and be back just after the turn otherwise it will be a long kayak drag to the trailer. As we poked about this afternoon we went into some of the booked out campsites within the national park. They are chockers with caravans, large campervans and huge coach-style mobile homes with generators. This set me to thinking about national park priorities. I would have thought their charter would be to first serve low impact travellers. The coast line around here is beautiful. On the horizon, probably about three kilometres out, is the protective reef and between the reef and the shore is a tranquil lagoon where we will go paddling tomorrow. There are a lot of fishermen in the caravan park and late this afternoon at the cleaning bench they were showing off their catch to each other. These days the fish haven’t got much of a chance. Big boats with powerful motors take the fishermen to any spot they desire and the GPS and depth sounders can pinpoint a reef or location with an unbelievable order of accuracy. No wonder marine parks and fish sanctuaries are being established, otherwise the boys in their boats would fish until there is nothing left. By the end of next year 60% of Australia’s coastline will be marine parks, and not before time.